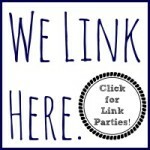 A few weeks ago, some of my favorite blogging friends collaborated on an epic play project–25 Fall Play Invitations. 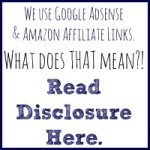 Are you familiar with play invitations? Play invites are simply engaging setups that invite kids to play. There’s no parental agenda or expectation that kids will play in a certain way. Ideally, these invites engage the senses, minds, and interests of our kids. It’s child-led, play-based learning at its very best! Starting today, the play invitation series is BACK, and I’m thrilled to be involved! 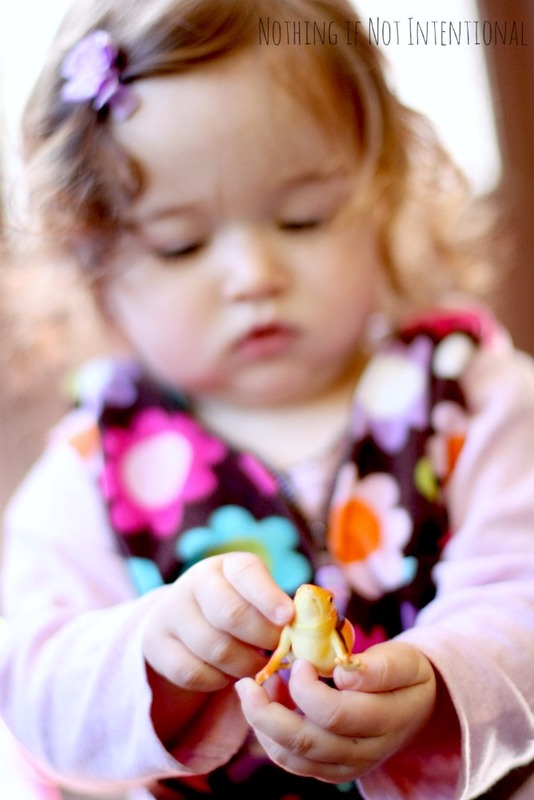 For a more detailed introduction to play invitations, check out these helpful posts from two amazing bloggers who popularized and led the way in the Play Invitation movement: Teach Preschool and The Imagination Tree. Can you guess the theme for this next series? My girls are three and one, and I wanted to try to make an invitation that would appeal to both of them; it worked! I set out our plastic cauldron and filled it with Spanish moss, spiders, snakes, and frogs. I also added a few spiders and worms to a pumpkin dish and ice cube tray. I didn’t know exactly what the girls would do, but I wanted to give them options. We’re only a few weeks into age three, but I can already tell that three is going to be a big age for pretend play. When our three-year-old saw the creep-crawlies, she immediately animated them. The frogs hopped and “ribbeted” all around our porch. “You need to BAKE them?” I asked incredulously. 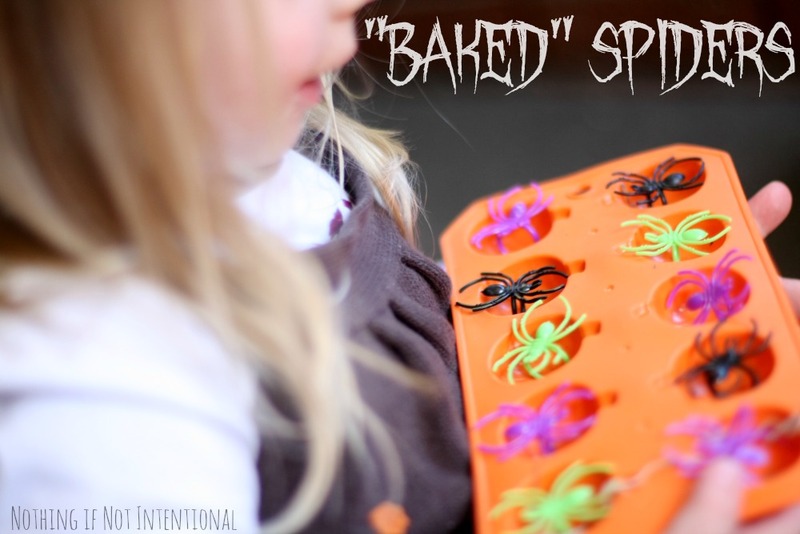 Yes, you read that right–she took her spiders to the bathroom and “baked” them in the bathroom cabinet. While big sister was off “baking” her spiders, the baby was busy exploring the invite in her own little way. She decided to start with challenging her fine motor skills by plucking the little critters out of the Spanish moss. Her big thing now is TRANSFERRING, so it didn’t take her long to start placing all of the materials into the cauldron–the spiders, the worms, the frogs, the ice cube tray, a nearby slinky, it all ended up in the cauldron. Did I expect to see a slinky in the cauldron or baked spiders in my bathroom? Nope! But that’s the beauty of play invitations. They can end up in places you might never expect. 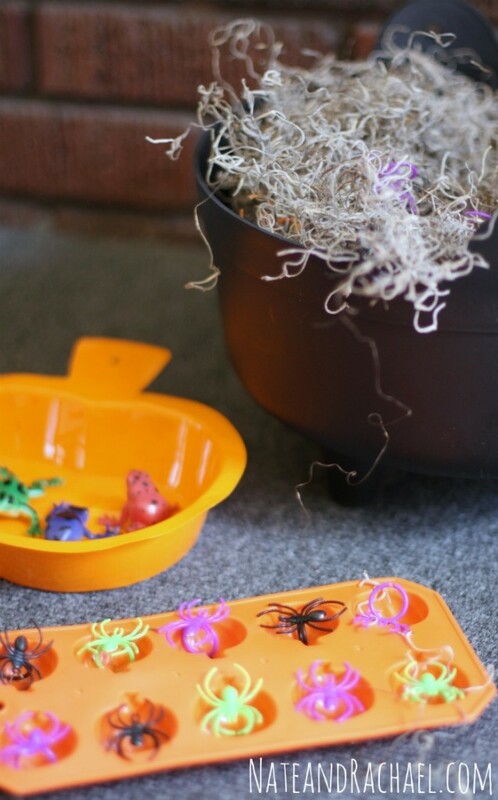 Pumpkin plates, orange ice cube trays, other re-purposed Halloween items that could be used for sorting, transferring, or (pretend) spider baking. 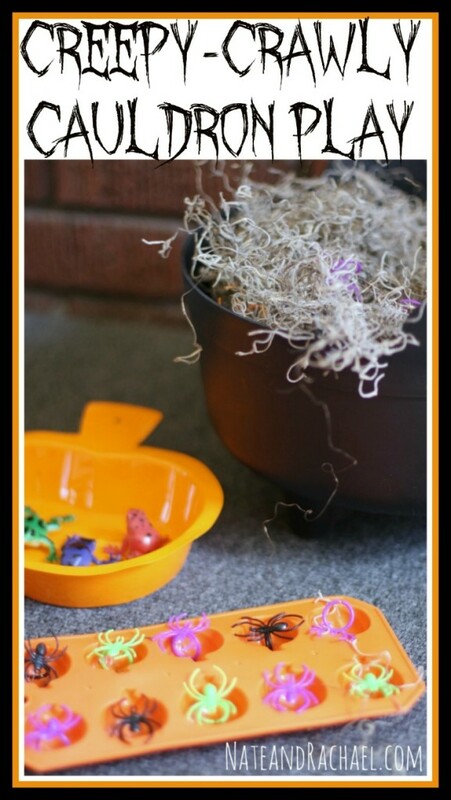 Note: We made a spider sensory bin last year for a play date, and it was fun for the kiddos to pick out rings to take home as a candy-free Halloween treat! To be sure you don’t miss the next play invitation, we’d love for you to follow our blog on pinterest, subscribe by email, and/or join the conversation on the Nothing if Not Intentional facebook page! 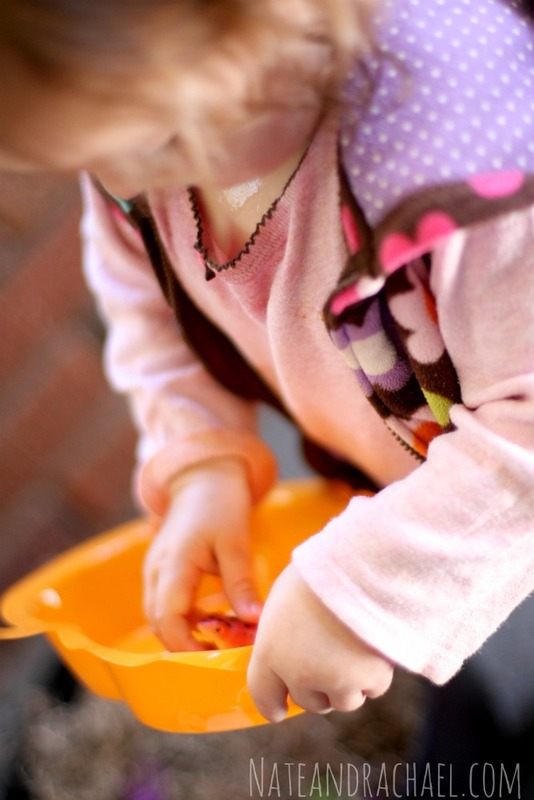 So glad I stopped by – what a great activity for wee ones! LOVE that your daughter needed to bake her spiders in the bathroom 🙂 Of course she would!! I love this! Great invitation for kids of multiple ages. I’m sure it would be a hit around here. I am still giggling about baking the spiders in the bathroom!! 🙂 I love how this fun invitation is appropriate for all ages. My preschoolers would love having this in our home center, actually! I swear I have my Halloween week plans written just from the ladies in this series!! I love this! So creative. And it’s so cool to see how each of your girls plays so differently with the invitation. So glad you joined in the fun this time around!! I love this idea! I pinned it to my Halloween board too. It looks like so much fun. 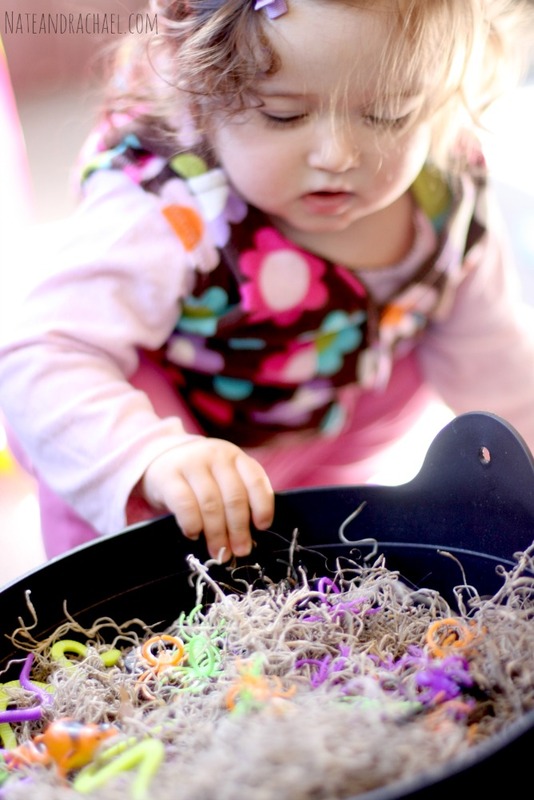 I would love for you to stop by and share it at my sensory play pin party live all this week! I just linked up! I like the name of your water bead activity. 🙂 Thanks for reading, commenting, and inviting me to your sensory play party! The baked spiders totally made me laugh! 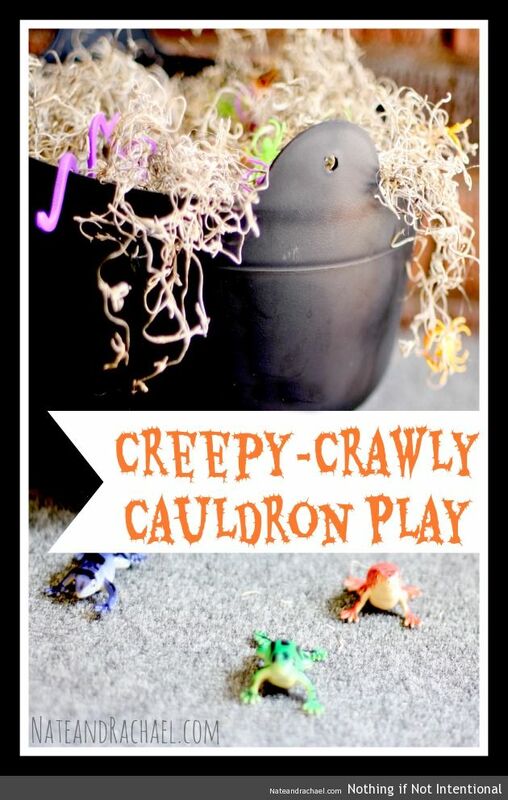 I *love* how you set this up–I’m sharing it on my PreschoolPowolPackets Facebook page and my (CarlaINHouston) Halloween board on Pinterest! What a wonderful activity! I love the idea of baking spiders. Pingback: Play ideas to match your Halloween costumes!